Well here I am back at work after a year "off" (laughs manically) and one of the best things about being at work is the potential for a blissfully uninterrupted lunch. 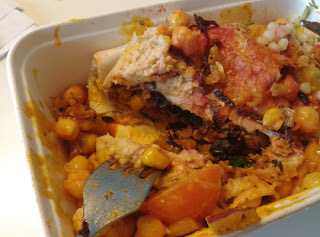 As there are so many lunching options in Brighton and plenty of choice for take away, I'll be posting an "al desko" series of reviews for those who lunch on the go in the city. I'm kicking off the series with one of my favourites, Iydea (Lydia, Idea, Lydea, Ikea - stupid name though, I always fail to get it right). 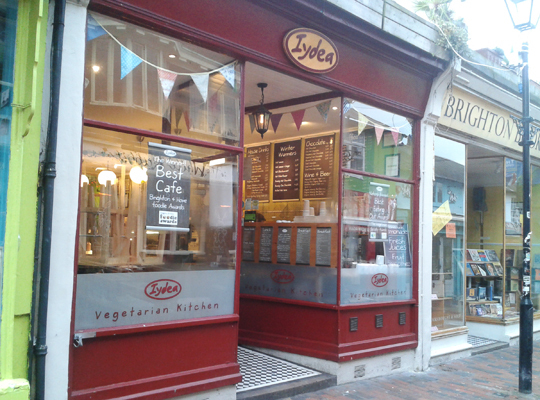 Anyway, name irritation aside, this is an extremely popular lunchtime spot in Brighton, winning plenty of local and national awards. Everything is vegetarian or vegan and the food is fresh, really tasty and above all, hearty. Even the regular sized meals (you can opt for a large option) is enough to make me want to crawl under my desk for a post lunch snooze. In a good way. The concept here is simple. Choose a main meal from a daily changing selection (ie. Tofu Spanakopita, Sweet Potato, Spinach & Tofu Massaman, Vegetarian Lasagna, Enchiladas, Burgers, Flans...) add 2 vegetable sides (Carrot in Lemon & Chive, Pesto Mash Green Beans with Almond & Dill...) or salads (Middle eastern jumbo cous cous, Beet, Chilli & Ginger Slaw...) and finally, two toppings (Tzaiki, Hummous, Chutneys, Mixed Sprouts...). People must return here again and again as there is always plenty of choice from the heaving display and beats the same old, same old from the local sandwich shop. I suppose the only issue with so many sides is that everything is very flavoursome, seasoned and spiced that if you are a bit of a food magpie you could get one heck of a confused plate of food, mainly evident in the deep takeaway boxes as you have to dig away with your fork for the main component. I normally choose something contained like an enchilada, pie or this time a Spinach & Sweetcorn Jambalaya filled Roti so I can "barrier" the main bit from all the sides. The roti had a great hit of fire and spice, and wasn't too heavy with the sweetcorn and spinach. 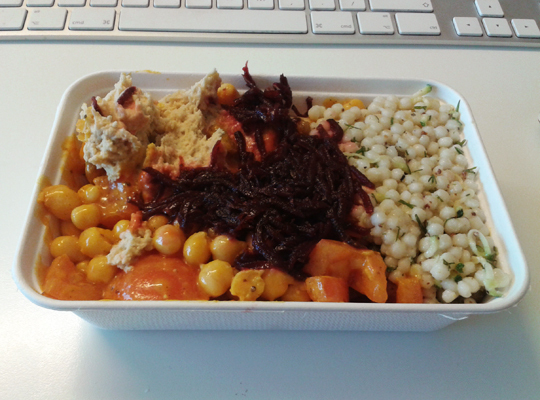 The Coronation Chickpea Salad and Courgette Jumbo Pearl Cous Cous made delicious and interestingly textured sides. My favourite part was the homemade Beetroot Chutney though, sweet and perfectly sharp for a pickle head like me. Despite it always busy at lunch, the army of staff manning the counter ensure you are seen to fast. You have got the option of eating in but I always choose to take out and eat al desko. Meals range from £4.70 to £7.70, although I've yet to spend more than £5 for a lunch so far, and for what you get, is fantastic value. Everything feels very fresh and healthy and with so many places to choose from to lunch locally, its success is clearly deserved. It's a hard one to beat.